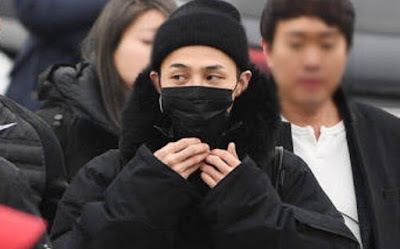 It has been about a month since G-Dragon, the king of k-pop, joined the army. He's currently being trained at a boot camp located in Cheorwon. Are you curious to know how he's doing in the military? Well, you don't have to worry. He's adjusting well to military life. You know, GD is a super star, and unlike most of the other male k-pop idols, he has not only many female fans but also lots of male fans. He is an icon of Korean popular culture and is a role model to Korean people in their early 20s. Young soldiers who joined the army with GD and is currently living with him have been admiring him too. So can you guess what's happening now in the boot camp? GD is enjoying great popularity among soldiers. Some of them even asked GD to write letters to their families instead of themselves, and GD, who is well known as a nice and kind man, readily granted their requests. Even though GD is about 10 years older than the young soldiers, he's getting along well with them, and the soldiers, who call him "Jiyong hyung", think of him as their big brother. Well, GD, who has been the charismatic leader of BIGBANG for a long time and has much experience, is like a spiritual leader for the young soldiers. And of course, GD, who has a strong sense of responsibility, is doing well in the training program too.